Sergio Aguero scores twice as Premier League defending champions Manchester City beat FA Cup champions Chelsea 2-0 to life the community shield. Aguero nets the first goal - his 200th goal for the club- after 13 minutes, when he picked up the ball just outside the box after some fine play by teenage sensation Phil Foden, and slot the ball into the bottom corner to beat Willy Caballero. City dominated for most of the match as 17-year-old Callum Hudson-Odoi was the only one trying to create something for the blues, Claudio Bravo fumbled a long-range shot by the teenager, the only shot on target by Sarri's men. Sergio Aguero grabbed his second of the match with a fine finish after Bernado Silva played a lovely through ball for the Argentina striker. Both teams were allowed to take water breaks due to the heat which could also be a reason for the lack of tempo and intensity during the match. Sarri's reign as Chelsea manager is just about three weeks old and it seems the Chelsea players are still coming to terms with the new fluid style of football by the former Napoli manager. 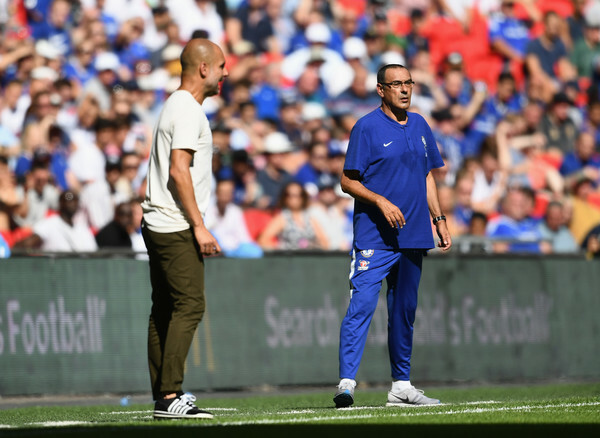 Pep Guardiola is a big admirer of Sarri's style of football, they both see each other as friends, City's victory is a good way of reminding Sarri that there is so much work to do with this Chelsea team.